If you drive to Disneyland you have to park which costs $15 per day, more if you have a larger vehicles. Once parked you have to shuttle to the park gates. For detailed parking information Click Here. If you have a stroller and other bags with you it is a hassle to load and unload everything twice, so check with your hotel to see if they have a shuttle service, it may save you money. If you have AAA you can get discounts on parking if you buy online in advance. If you stay at a hotel within walking distance to the park, then that will also save you money. If you own a Disneyland Visa card you will be offered discounts on hotels before the general public usually 3-7 days prior. The food in the theme parks is overpriced. Disney states no outside food or drink into the theme parks “with the exception of food items for guests with specific dietary restrictions”. Unofficially the “no outside food” policy is not strictly enforced. They will search your bags, but a few items in a small sized, soft cooler that holds sandwiches, granola bars, yogurt, juice boxes and sealed/unopened plastic bottles of water and soda will be ignored. They absolutely will not permit: Hard-sided coolers, glass containers or alcoholic beverages. They won’t let you bring unassembled sandwich items like a loaf of bread and a jar of peanut butter, but they are okay with pre-assembled sandwiches. You can eat your meal or snacks discreetly, then no one will say anything to you. If you would rather not take the risk then you can use the designated picnic tables outside of the gates of Disneyland. 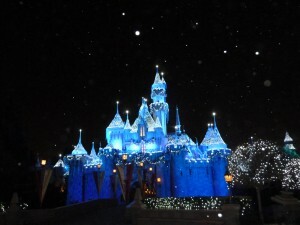 There are lockers available that are large enough to store a medium sized cooler.We would always eat breakfast at the hotel, then bring our lunch, then buy dinner in Disneyland. We would also bring in our own soda, water and juice which saved us money. Instead of buying popcorn for $6 a container that they won’t let you refill, we just pop the popcorn in our hotel room and brought it in our own re-useable bucket. That way you can buy the healthier popcorn with less butter. There are different ride wait time applications you can download for free if you have a smart phone. They will tell you how long the wait times are for each rides. It is really useful and they are pretty accurate. You can’t take the strollers into the lines for the rides, but everyone just parks it outside in the stroller parking. Even 5 yr olds get tired walking around the park so it is a good idea to bring a stroller or rent one. My five year old would be so tired by the time we walk out of the park both of my kids would be asleep by the time we left the park. Strollers are nice to keep your bags and snacks instead of having to carry them. 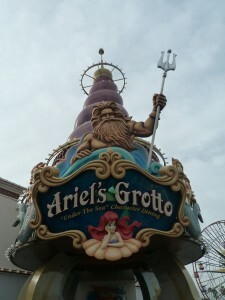 The best place for Dining with Princesses is Ariel’s Grotto in California Adventure. Make your reservations in advance. You are able to dine with Ariel and 5 other princesses. They come around to your table and talk to the kids. The food there is just okay and it is a little pricey, but that is where you can dine with the princesses. There are other Character dinning. Check the Disney’s website. 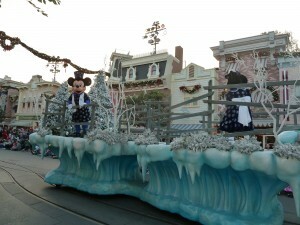 They have a parade everyday on Main Street in Disneyland and California Adventure. Wait in line early, even up to a couple hours if you want good seats. Bring a blanket it helps save more seat than one. Thanks for visiting Disney Tips & Tricks. Please comment if you have more tips and tricks to add!